When we first saw the add for our dog it said "Alaskan Malamutes". Both hubby and I wanted a northern dog, so we went and looked at them. We had no idea what an Alaskan Malamute should look like. Our computer was in the shop or I would have looked it up on the computer. So anyway, we got there and there were these cute puppies all with blue eyes. The parents were there and also had blue eyes. We picked one out and took her home. She was black and white with pretty blue eyes. They gave us papers for her that listed her as Malamute. She cost $300! When I got the computer back, I looked up the breed of dog and she didn't look anything like her ancestors. Someone told me she looked like a Siberian Husky and that Malamutes rarely have blue eyes. I looked up that breed and sure enough, there was my dog, black and white with blue eyes! We didn't care, we loved her anyway, but it would have been nice not to have been lied to and given fake papers. 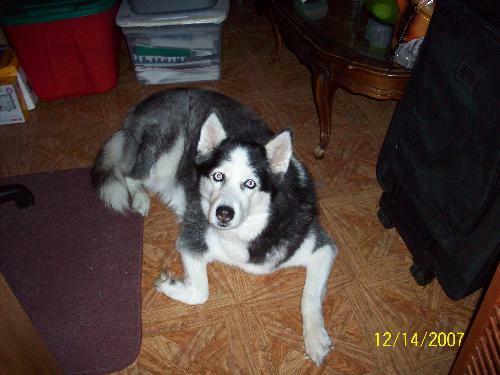 We never could find out if she was a pure breed of siberian Husky even though I had some tests done on her. We had her spayed and she is five now. She is a beautiful dog! Has ayone ever had confusion like this?